[Image: An "entire flotilla of floating greenhouses" by Dura Vermeer; as The New York Times writes, "For the first time in its long history, the Netherlands has begun to strategically uncreate itself," in the face of future oceanic flooding. "[L]ast year the government, at the start of a 15-year program, began buying up land and reserving it as flood plain, mostly along river banks. 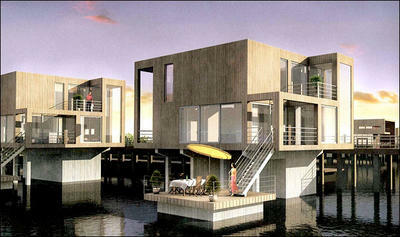 The Dutch are also exploring a solution as old as the first flood: floating architecture"]. 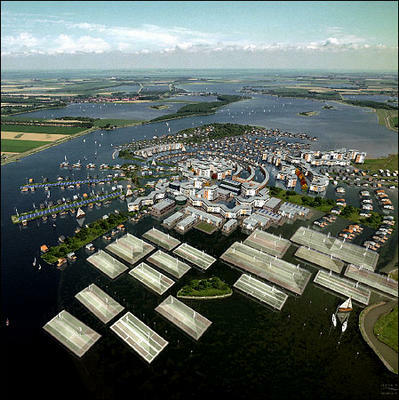 As BLDGBLOG explored in our series on Katrina – see Katrina 2 – the Dutch engineering firm Dura Vermeer has committed itself to building floating towns – pontoon cities – moored to the foreshores of Dutch inland waterways. In this case, it's the river Maas – and The New York Times takes us there. 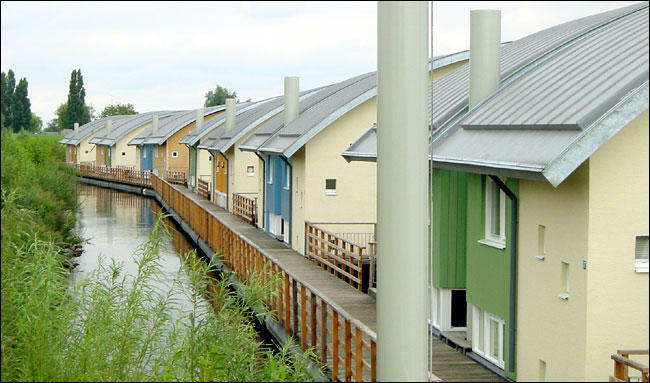 [Image: The town of Maasbommel, where "amphibious houses designed with lightweight wood by the Factor architectural firm" float on the River Maas]. Without going back through the specifics of Dutch terrain – vast sections of which are actually reclaimed Atlantic seafloor, only existing as dry land through a complicated network of levees, canals, and seawalls – it is worth quickly highlighting the obvious: that in a "post-Katrina world," whatever that is, a world with rising sealevels and accelerating polar thaws, architecture that can adapt to its hydrological surroundings – that is, architecture that can float – is now very much in vogue. "The goal," as the Times writes, "is a town that can live with flooding, not just wall it off, using a variety of floating structures and an extensive system for rainwater storage, among other means." (But, again, see Katrina 2 or the Netherlands Architecture Institute for more). So, Dura Vermeer's "brightly colored 700-square-foot homes, designed by Factor Architecten... are set in what was once a parking area for recreational vehicles," The New York Times says. It was once a car park! The U.S. should have no trouble finding a place to put floating towns, then. 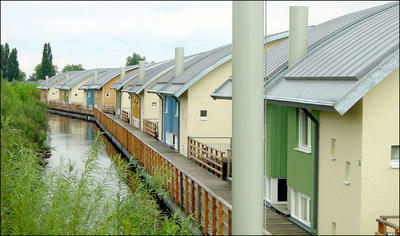 In any case, "'These are not houseboats,' said Ger Kengen of Factor. 'You have to design everything as if it were on the ground, only 10 feet up in the air.'" As if it were on the ground. The Earth, here, takes on the form of an architectural presumption. This absence of ground is not only architecturally stimulating – at the very least, inspiring images of stilt cities, floating railway yards, and perhaps even urbanism-meets-the-hovercraft – it's got something of a philosophical challenge to it, as well. To deal with this state of aquatic groundlessness, floating greenhouses have begun to appear – indeed, go back to the first image for an entire city of them. 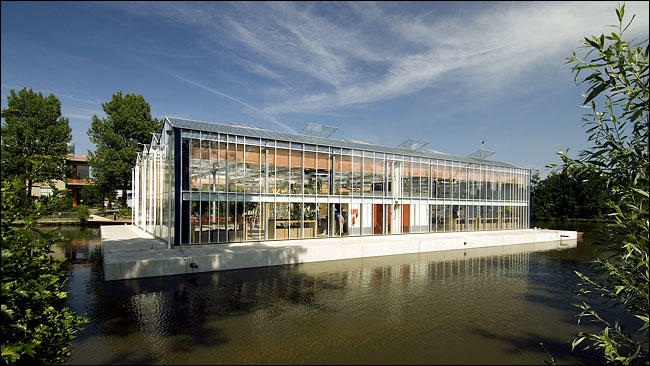 But a floating greenhouse puts the earth at a double-remove: first, the greenhouse, any greenhouse, already supplements its natural climate by altering the air temperature, humidity, and even oxygen levels of the air itself, forming a highly artificial microclimate in which things like rare orchids can grow. Second, you take that – a kind of fake climate – and you put it on pontoons, and all of Western philosophy goes haywire. Now it's a fake earth, enclosing a fake sky... and that's enough about that. But such techniques of hydrological adaptation are quite exciting to think about. How to make a house float; then the city around it; and could you still, perhaps, have a backyard pool? Even build-in a water purifier, so everywhere your house floats becomes potable... Drinking your own wake. [Image: "For the southern city of Dordrecht, Bart Mispelblom Beyer of Tangram has proposed 85 houses with parts that float"]. 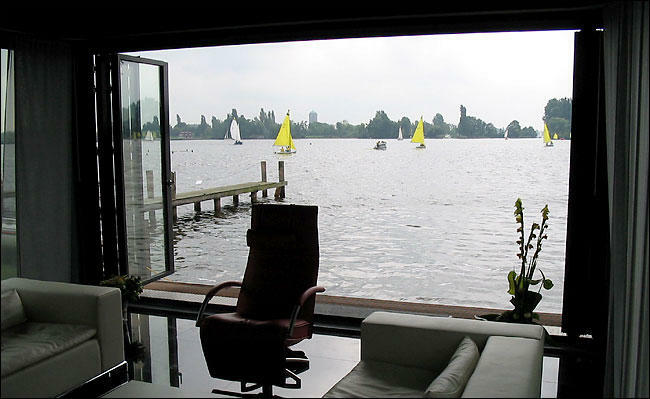 [Image: "Near Amsterdam, the living room of a floating house by Waterstudio"]. Meanwhile, if you want to watch a Dutch flood in action, check out this little video clip by MVRDV, though it can take a long time to load. Video clip here. Finally, check out the extremely thorough and depressingly well-illustrated review of the Rotterdam Architecture Bienniel's Flood theme, over at Core77.